The world needs more heroines, and Hippolyta Queen of the Amazons, Durga the Demon-Slayer and Al-Datma of Egypt are just a few of the legendary women who leapt over limits and fought to win. Sally Pomme Clayton's powerful retellings of strong woman stories from all over the world will inspire and stir your soul, and her action pages will help you to be a 21st-century Amazon. Amazons! 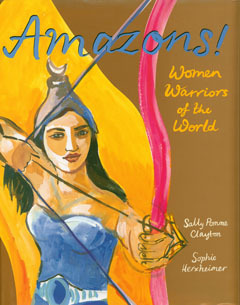 Warrior Women Of The World by Sally Pomme Clayton and illustrated by Sophie Herxheimer contains great stories of women with courage, skill, imagination and kindness. Perfect icons for 21st century young ladies. Clayton and illustrated by Sophie Herxheimeris available to buy now.